Kelowna, meaning "grizzly bear" in the native Salish tongue, is the largest centre in the Okanagan-Similkameen. It is situated on Okanagan Lake and is a major agricultural area. However, the hospitality industry is growing rapidly and visitors will enjoy activities such as an orchard or winery tour, golfing, skiing, fishing, boating, and kayaking. There is also excellent hiking and biking in the area. 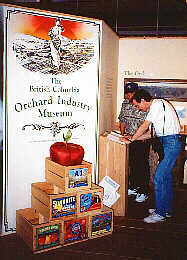 Located in the Laurel Packing House (1917) at 1304 Ellis Street, the museums offer the history of BC's orchard industry and a chance to discover some of the province's award wining wines. Excellent natural history exhibits are found here. This heritage site, founded in 1859 by the Oblate priest Father Charles Pandosy, displays the restored mission, chapel and schoolhouse. It is located at the corner of Benvoulin and Casorso Roads. 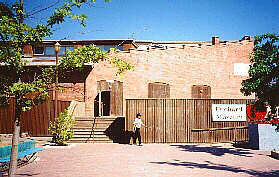 Dating from 1891, this is the site of one of the first ranches in Kelowna. It now features an exhibit area, Edwardian Gardens and a restaurant. Visitors will find a breathtaking view of the valley from the Kelowna Crags. Access is via a 6.5km (4 miles) trail. To reach the trailhead follow Chute Lake Road. Once on gravel continue 7 km (4.5 miles) to a small dirt road on the right which leads to a parking site. The Kettle Valley Railway was constructed in the early 1900's to accommodate America's interest in Canada's gold, silver and agricultural opportunities. Thanks to Andrew McCulloch, an engineering genius, the grade does not exceed a 2.2% grade. Today the tracks of this coast to Kootenay link have been removed and provide excellent opportunity for scenic hiking and biking. Along the 5-mile Myra Canyon loop are eighteen trestles with spectacular views. Access is located via Forest Service Roads 30-minutes from downtown Kelowna. From Kelowna continue east through Winfield and Oyama, past the Kalamalka Lake, "the lake of many colours" and then to Coldstream and Vernon. From Vernon follow Highway 6 east to Coldstream and Lumby, " the Gateway to the Monashee Mountains" (Kootenay Country).